According to one of the most renowned names in Nepali Lok Geet world, Mr Nabin Khadka of Sankhuwa Sabha (Arun Upatyaka), the tradition of singing deusi started with the Magar Army. Mr Khadka explained,”The deusi tradition started with the Magar Army.The Magars invented Madal, and they were the original exponents of two dance forms Maruni and Deusi naach. Even though Marnuni dance was started in the western part of Nepal, it was in the east that it proliferated. 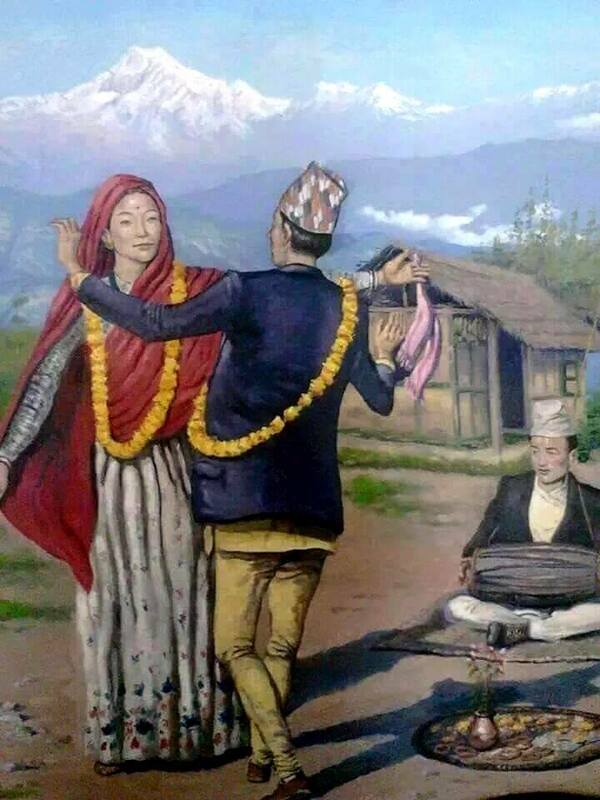 Thehe Magars adopted Maruni and mixed it with the eastern cultures, and developed the Sorathi dance, gradually these two dance forms spread across the Nepali world, so to them goes the credit of making Deusi popular among the masses. As far as singing Deusi is concerned, back in the days, from Rangit river in Darjeeling to Sikkim in the east to Arun nadi in the west, there was a Limbuwan kingdom which was ruled by a very pious Yakthumba king Bali Hang, he spent most of his time in performing dharmic ritualsand his most trusted soldiers were Magars. In their language, Deusurey meant “We”… Failo meant “Saved” [the kingdom]. Later when the king Bali Hang came to know about the attack and how his brave Magar soldiers had thwarted it, he ordered that every house in the kingdom be made aware of the incident. So after the king Bali Hang ordered the army to tell the story of brave Magar soldiers who had thwarted the attack the soldiers went from door to door sharing how they had saved the kingdom and the practice continued at the same date every year. Gradually the eastern culture spread all across the Nepali world and even today boys and men go from door to door singing Deusurey in the name of the great king Bali Hang. And thus started the Deusi practice. तिहारमा देउसी खेल्ने प्रचलन नेपालमा कहिलेबाट सुरु भएको हो ? देउसीको सुरुवात कसरी भयो त ? Deusurey story is very interesting, and if we look into our folklore, we find that Bali Maharaj is very popular in almost all the indigenous communities and not just among the mountain communities of India and Nepal, but also among the indigenous communities across India. My grandmother used to tell me that King Bali, was a mighty Kirat king, who was much adored and loved by all his citizens, he was the most generous and kind King to his citizens, but due to a misunderstanding king, Bali was defeated by Lord Vishnu, who banished him from his Kingdom.However, King Bali would find a way to visit his people once a year. Thus, those loyal to King Bali would go from door to door, telling the people the date on which the King would visit their village. Whatever be the story of the origin of Deusurey, it is a beautiful way of creating a bond in the community, among our people. Let us all strive to keep this unique tradition of ours alive. 2 Comments on "The Deusi Story – It Started From The Magar Army"
First let us know who r kirants, the term finds its place in Yajurved about 4500 a d. The literary meaning in sanskrit conforms Kirant means “jangali” or “असभ्य” and this was exclusively used for Non Aryans so non – Aryan cud be any one say Dravidians , Khambus, yakthumbas, and so on entire population those do not follow the way of life of ARYANS i. e. Hindu way of life. Actually King Bali as referred here in Deosi song the most powerful personality of south India who had confronted outsider invadors-वैदिक Aryans, who killed him but the story as mentioned in Hindu granth do not at all sound scientific goes as lord Vishnu conspiring asked king Bali as to where shall he place his third step…. as story goes that king Bali offred his head for the feet to be put and slide deep inside earth to ‘Patal Lok’ means he was assassinated to establish hindu way of life..or kingdom … Now to mention that in Nepal there have been stronghold of Brahamins and many were from South. The complete story or episode if we go through there are no evidence in the ennals of story or history where a King by name Bali ever existed in the land of Nepal or in the land of Khambus, yakthumbas or yakkhas and magarats, It all seem to happen under conspiracies for maintaining Brahmanical supremacy utilising power of the then kings. But I do agree with the fact that there must have been rich culture of some different kind or say some way the Magars use to celebrate but that got wind for change of direction. Please let us keep aside the confusion among east n west culture as we all know Maruni is highly recognised cultural dance emanates from west . Let us remember one thing that Britishers recognised नेपाल for undounted action of bravery cos of 600 ” ठेठ” brave of the bravest Magars non else. ‘Daju bhai ho Bhram ma na parnus. hos’. ‘satya ma basnus vijai agari chha.’.By the way in the name of King Bali the Keralaits celebrate Onam.